Jackson Bark stone sign created by sculptor James Lax , incorporated into an agility feature with stairs and slide. Wheelchair and stroller access, one of three entrances/exits. 'Lightning Bolt Walk' has two elevated tight turns; constructed of two construction horses and five rubber speed bumps. Stool Circle also doubles as sitting circle for pups and puparents a like. Jackson Bark is a community dog park located in and named after Jackson Park, Chicago, Illinois, United States. The dog park is an adaptive reuse of four abandoned tennis courts built with over 90% recycled materials, making it the largest 100% enclosed dog park in the city. Development began in the spring of 2014 and has been growing and evolving ever since. Jackson Bark is completely funded and maintained by the community and charges no entrance fee. 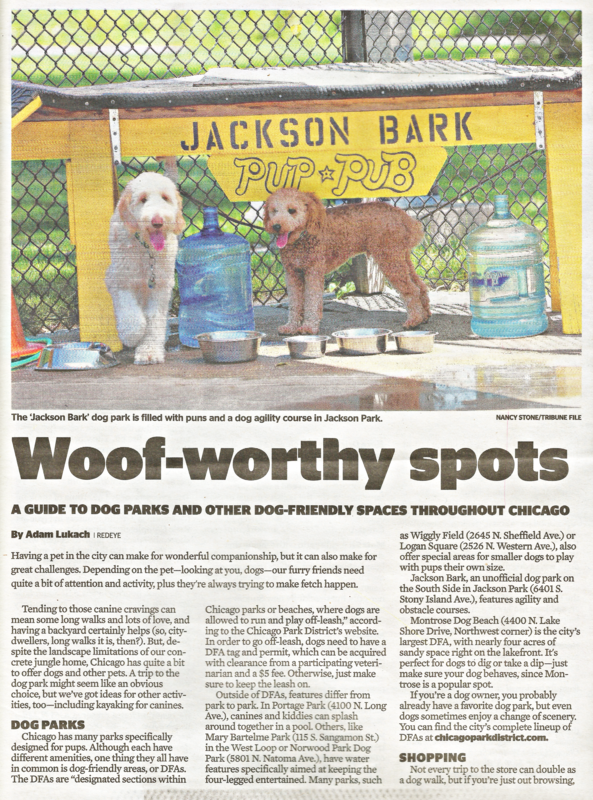 With over 20 dog parks in Chicago, Jackson Bark is the first dog park on the southside, plus has more amenities, dog-friendly/safety features and photo-ops than any other community dog park in the state . Features include a free parking lot, lights, 3 canine drinking water stations, 3 double-gated entrances/exits (including wheelchair accessible), 1 first aid kit, 1 bunker, 1 fort, 4 toy baskets, 2 teeter-totters, 6 benches, 12 chairs, 5 tables, 3 garbage bins, 3 ramps, 20 bag dispensers, 15 cardboard scooper dispensers, 6 sun-shades, 7 wade-pools, 2 a-frames, 6 walks, 4 tunnels, 2 hurdles, 4 hoops, 2 time-outs, 2 weaves, 2 tire-hills, 1 shaded pup lounge, 1 spool-circle, 1 community board, 1 news board, 1 lost dog board, 2 tether-balls/poles, 2 pause tables, 1 middle fence/gate, 1 art gallery corner, 1 puparazzi/red-carpet, 1 giant fire hydrant, 1 K9 memorial photo-op feature, 1 website (plus a dozen social media sites) and a Little Free Library. Jackson Bark is an accumulation of best practices in upcycling, inspired by unique dog park amenities, Wiggly Field's Time-Out and Dog Mountain's Dog Chapel, and by the work of contemporary artists George Rodrigue, Stephen Huneck and Clet Abraham , Izaac Zevalking , and Jackson Pollock. ^ "Jackson Bark - documentary". Chicago Aussie 2017. ^ "Man Turns Abandoned Tennis Courts Into Flourishing Dog Park on Chicago South Side". GoodNewsNetwork. ^ "Jackson Bark - Official Website". ^ "Best Dog Park". Chicago Reader 2016. ^ "Best Dog Park". Chicago Reader 2017. ^ "The summer guide for Chicago dog owners". Chicago Reader 2017. ^ "Best dog park". Chicago Magazine 2016. ^ "Best Parks For A Puppy Play Date In Chicago". CBS News Chicago 2016. ^ "The 15 Best Dog Runs in Chicago". Foursquare. ^ "The Best Dog Parks in Chicago". TaskEasy Blog 2017. ^ "The Best 10 Dog Parks in Chicago". Yelp. ^ "14 best dog parks in Chicago". Curbed Chicago. Retrieved 2018-08-28. ^ "Woofworthy Spots - A Guide to Dog Parks". RedEye 2017. ^ "A Dog Meet Dog World". South Side Weekly 2017. ^ "Best Dog-Friendly Vacations in the US for Families". Minitime 2017. ^ "Jackson Bark, South Side's Only Dog Park, Scrapped In Golf Course Expansion". DNAinfo 2017. Archived from the original on 2017-09-02. ^ "America's Best Dog Parks by State". Woof : The Dog Lover’s Social and Dating App 2018. ^ "Dog Friendly Parks : Places That Allow Dogs | Hellow dog". Hellow Dog. 2018-02-20. Retrieved 2018-08-28. ^ "Chicago Park District Golf: Jackson Park Golf Course". Chicago Park District. ^ "'Jackson Bark' in Danger of Closing as Part of Golf Course Expansion Plan". NBC Chicago 2017. ^ "South Siders push for dog parks". Chicago Tribune 2017. ^ "Development threatens one of the south side's only dog-friendly areas". Chicago Reader 2017. This page was last edited on 22 September 2018, at 07:40 (UTC).